The Princess Victoria is in Shepherd’s Bush, but just barely. It’s a good 20 minute walk West from Shepherd’s Bush Market station down a rather unpleasant stretch of Uxbridge road, which in 30 degree heat and a pair of high heels isn’t very nice at – especially when you’re late for a working lunch with a journalist friend. But upon arrival, you’re immediately transported into the refined and elegant surroundings of what clearly is a gastropub with a fantastic interior design budget. 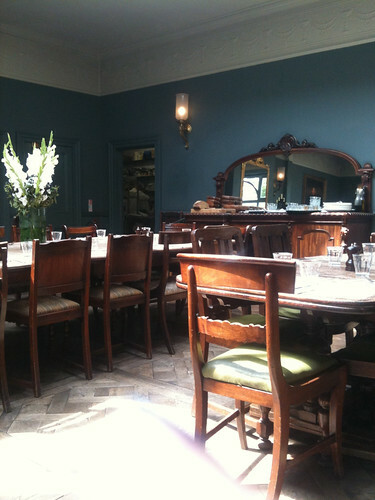 Gorgeously striking navy walls, vintage chandeliers, old newspaper clippings framed on the wall and the sort of chairs and tables that cost £600 a piece at Portobello Road Market make it a rather lovely place to have lunch. 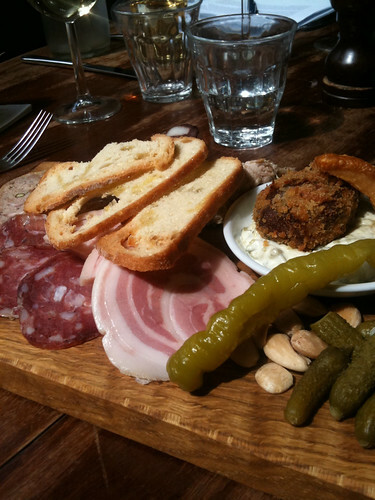 The menu is standard posh gastropub with a rather large selection of nibbles, bar snacks, starters, mains and desserts – probably a good 30 dishes in all. It was small, but packed a punch. I know I’m going to cause some groans from a few readers on this, but there is a thing as too much chorizo. 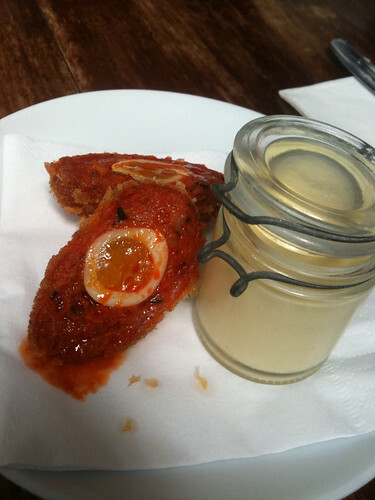 The casing completely overpowered the quail’s egg. I really wish they would have opted for a full-size hen’s egg instead. 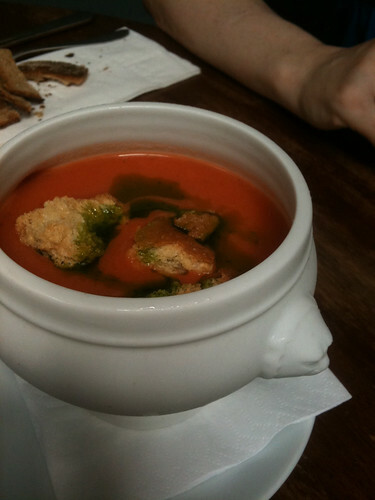 The Gazpacho (£5.50) was a more popular choice, especially for such a hot summer day. It was fresh, light and perfect. It could stall other gazpachos flat, I was assured. 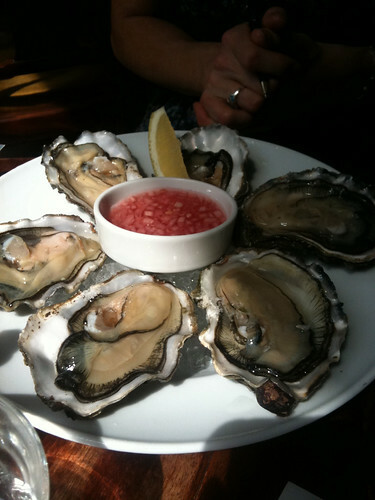 There was a similar reaction to the plate of Oysters, and unbelievable value for £10.50. So much pork has made my memory a little fuzzy as to what was on the plate (and the Princess does not list her menu on her website, for shame), but I do remember some salami, pate-type spread, homemade blood sausage and something I can only describe as shredded-pork heaven rolled in bread crumbs and fried to perfection. Yum! 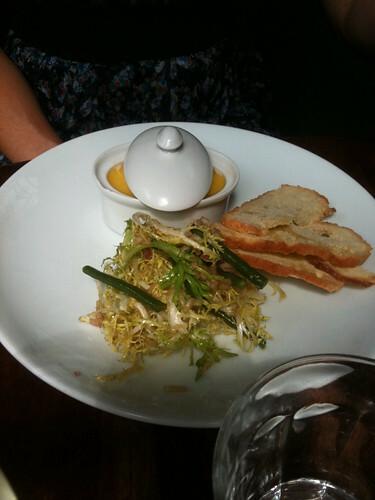 Also on the table was the Potted Shrimp (£8-ish), which on the smaller side of starters-as-mains. 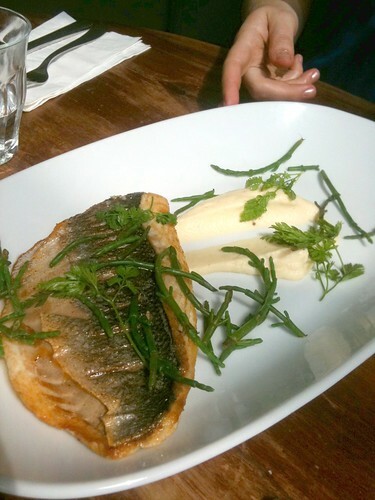 We weren’t impressed as a whole, especially at the layer of butter over top that weighed down the sweet, fresh prawns. A generous portion of fish, but unfortunately no sides unless you count the smear of pureed cauliflower (which I do not). It was a decent dish, but from my view it looked a little too oily once you got past the thin layer of skin, and my friend left hers half uneaten. Despite the mixed bag, I really did enjoy the Princess Victoria. We made a few wrong choices, but I’m quite confident there is enough on the menu for even a table of 10 to be happy all around. For those who live in the area, I can imagine it being a fantastic place for a lazy Sunday lunch or a post-work drink.